Escali scales are quality tested to meet our rigid standards to ensure customer satisfaction. 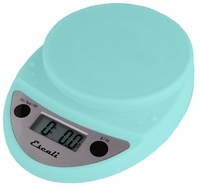 This aruba blue Primo digital scale has a max capacity of 11 lbs and features easy two-button operation. This scale gives you the ability to measure in grams, ounces, or pounds and ounces. Its compact design runs on just two AA batteries, making it highly portable, and its removable stainless steel platform is NSF certified.